I've accumulated a lot of necklaces in the last couple of years and they were starting to get hopelessly tangled in my jewellery box. 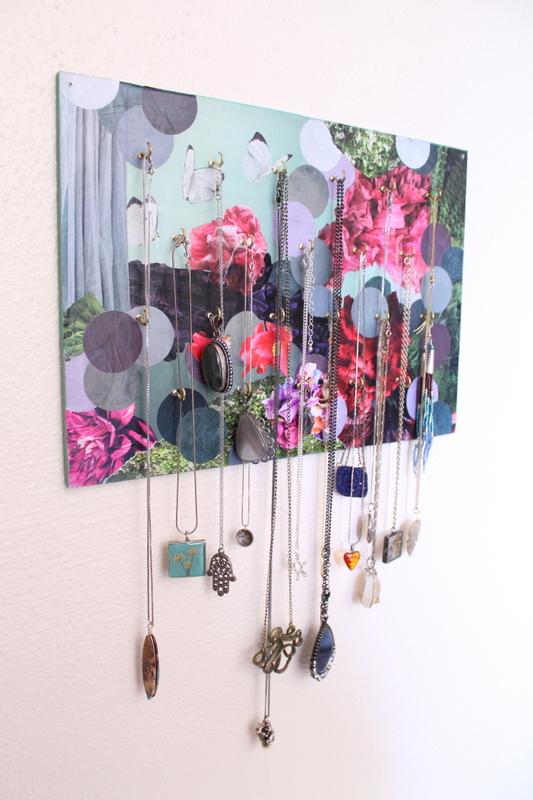 Back in high school, I had made hangers for my necklaces and earrings and wanted to do something similar—if a little more sturdy. Those early versions were made of foam core that I stuck pins in but for this one I used a piece of particle board that I had leftover from another project. For my 1.0 versions, I had covered the foam core in collages made from fashion magazines, so that was my first idea for this one as well. I looked up 'necklace hanger' on Pinterest to see if I could find anything more interesting and, while there were some great ideas, most were a variation on this branch theme and a bit plain for me. I wanted colour in mine and a feminine touch. I decided to copy my teenage self and went through the few issues of Vogue that I have left for ideas. I liked the idea of incorporating elements from fashion since I would be looking at it every morning when I got dressed. I found myself gravitating towards soft, feminine colours, patterns and textures. I ripped out anything that caught my eye until I had a big stack of images. Then I started cutting out pieces, mostly flowers and ruffly parts of clothing. I also cut a stack of circles to help make the background. I assembled the pieces I wanted, moving them around quite a bit before glueing them down. This was the hardest part since I struggled to find a composition that I liked. I kept adding to it until it looked right. I used a matte medium to glue the pieces, putting a layer of it over every piece that I stuck down. The thin magazine paper buckled quite a bit with the wet medium, and though they mostly smoothed out when they dried, I think it might be better to use a thicker medium that isn't as wet. Once all the pieces were in place and the medium had dried, I painted the edges in a colour similar to the background, and covered the whole thing in a gloss varnish. Next, I measured holes every two inches, staggering them every other row, and drilled through the particle board. I screwed the smallest hooks that I could find into each of the holes. I didn't have any mounting hardware at home (and didn't have time for a trip to the hardware store) so I drilled a hole in each corner and hung it with fishing line. 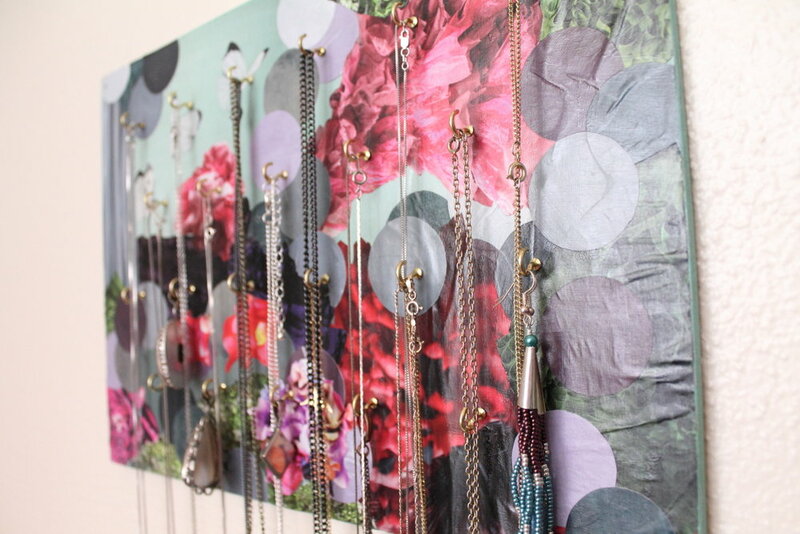 This was super simple and fun, and I really enjoy having this touch of femininity in our very masculine bedroom. 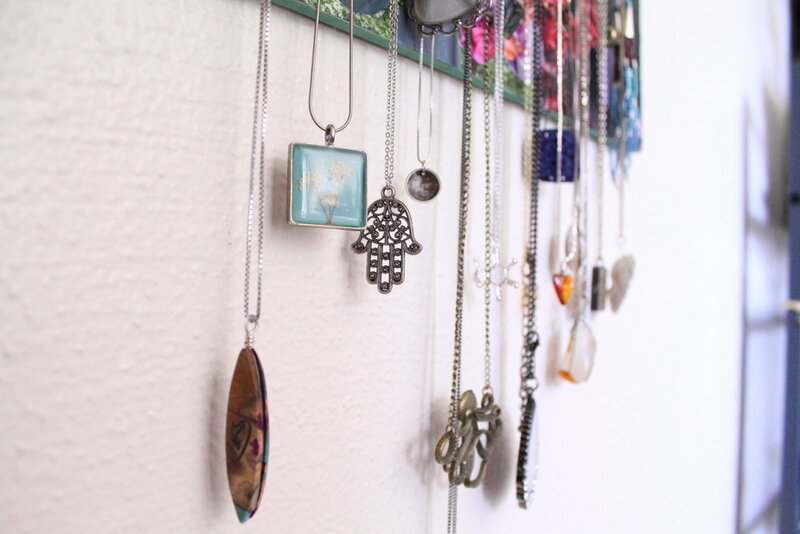 It makes getting dressed in the morning so much easier since I can easily see the necklaces I have to choose from, and don't have to spend any time untangling them. I love it!